More and more, our new modes of working and operating involve a high level of collaboration. But it appears that collaboration is more difficult than it seems at first glance and, passed the first excitement of a new collaboration, sometimes quiet quickly problems appear between the people involved. 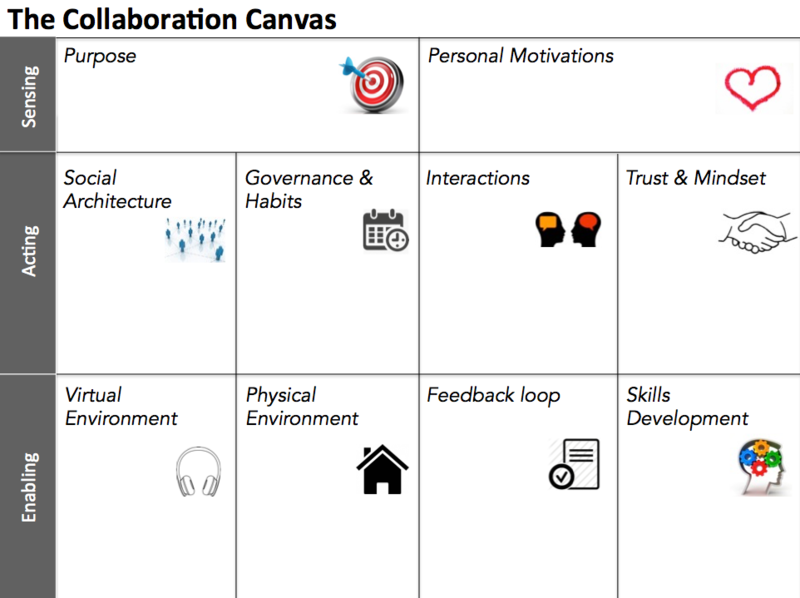 The « Collaboration Canvas » is an easy tool to use aimed at initiating collaboration while addressing at the same time some deeper dimensions needed for a good collaboration. What you find here is “work in progress”, I suppose and hope it will grow over the coming years. My purpose is to share my discoveries and practices in “open source”, feel free to use it and whenever you have some ideas or comments, please share. A workshop of ½ day : it is the simple format that will produce after one session a tangible output that enables a team to start its collaboration or to improve it. The priority is given to the deliverable at the end of the workshop. A training of 2 days : the underlying concepts as well as several supporting tools are developed. This training will enable the participant to implement themselves the Collaboration Canvas and to use it at its full potential. Copyright © 2019 Collaboration Canvas.